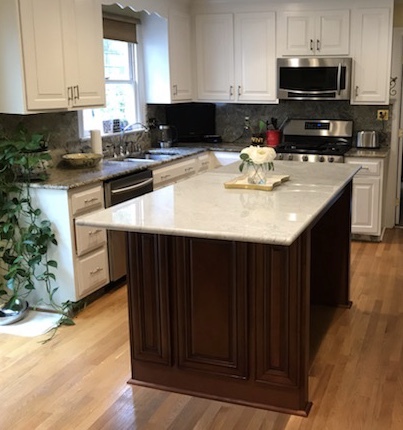 Since 2006, Panda Kitchen & Bath of Richmond VA has been providing Richmond area neighborhoods with the finest granite countertops, kitchen cabinets, and stainless steel and porcelain sinks in the region. 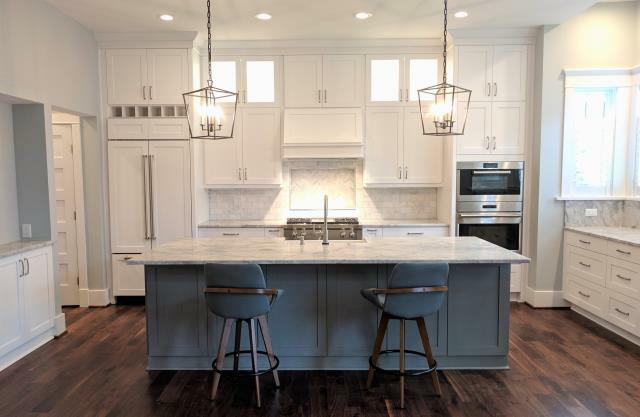 With our superior crew of experienced designers, installers, and project coordinators, no kitchen or bath remodeling job is too large or too small. 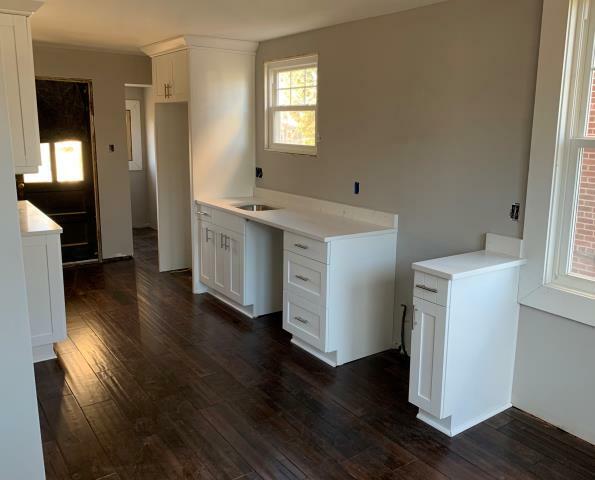 In addition to the wide range of cabinet and kitchen countertop options to choose from, we also proudly offer free measurements, designs, and estimates for each remodeling project. 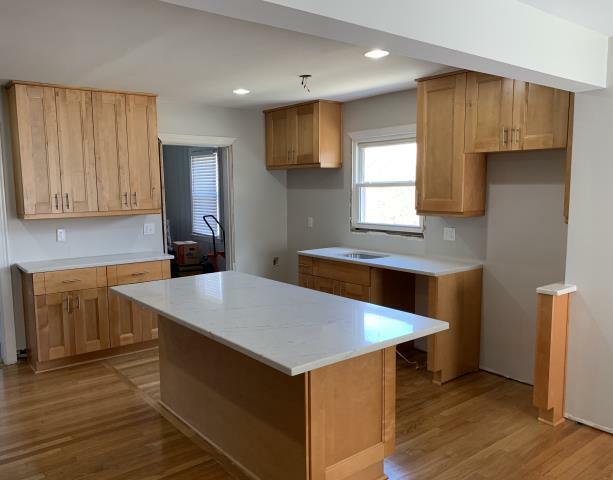 We offer high quality granite and natural wood materials at great prices, along with complimentary estimates, measurements, and designs for every job. Whether you’re looking for just a minor update to your home, or an entirely new look, call us today to set up a consultation. May and Jay’s team were meticulous in their attention to detail and excellence in workmanship. In addition, their personalities were professional as well as inviting/personable. This company’s work ethic in 2018 is superb just as it was in 2009! When/if we have additional work to do, you guys will be first on our list to check. Thank you. Love my kitchen will put company name out there. Thanks Jake for the advice on the square vanity bowl. Easy process, wonderful service, great price! Thanks to Panda Kitchen we now have a beautiful updated kitchen! The process was easy and the completion dates right on time with good prices. We love our new cabinets and quartz countertops! Panda provided custom cabinets for three baths in a timely professional manner..
Exceptionally great to work with! May was professional, knowledgeable and very eager to provide us with just the right kitchen design that fit our space and needs. From the design to the installment we were very happy with how everything worked out. You will get a high-end result at a reasonable price at Panda Kitchen and Bath! 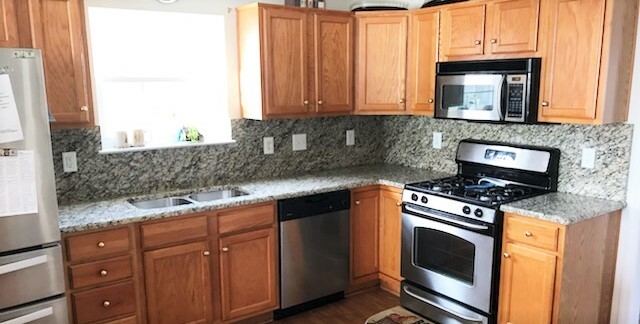 I am very pleased with the entire process...from meeting with Molly and having her design my kitchen, a small one at that, and give me everything I wanted in it, more countertop space, storage and space for a dishwasher. Older home that didn't have a dishwasher. Then having to change the design because the original measurement was off. After the re-design I was just as happy if not happier with new layout. Then the guys came in with the cabinets and countertops and worked hard and had them in in a day. That TV show that everyone watches with all the house renovations... I now have "that" kitchen. The one that the transformation is in the "wow factor". So thanks to everyone at Panda Kitchen and Bath for all your hard work. I'm thrilled with my new kitchen. Great Service, Good Price! From start to finish, an easy experience! We were very pleased with our kitchen renovation from all aspects. Mae was a pleasure to work with on the design and and was very patient with us. The guys that did all work were very efficient and detail oriented. We would work with them again and recommend to all. Great service from Molly and good value ! On Time Delivery and Install, Great Knowledge about product. Fantastic results, great price and service. Great Service from representative and the price was in my range. Molly was very helpful with me in coordinating my cabinets and countertops. Not only that she would let you know what looks good (not too busy) with the cabinets and I really like that coming from her. She would not sell you anything just to get a sale. I could call her and she would explain the schedule and what they would be doing at your house. I was very pleased with her. I wholeheartedly recommend every aspect of Panda Kitchen's design and installation for your custom dream kitchen & bath. I'm very thankful that a friend told me about May, Molly and Jay. I love my new kitchen & bath! Thanks Guys, you are the best! We are very pleased with our new bathroom vanities and the service we received. No issues. Always pleasant and helpful. Genuinely interested. Excellant service and great price. Panda delivered a beautiful top on time and in a professional manner. It was the coldest day of the year and snow on the ground. They even shoveled our sidewalk to keep from tracking snow into the house. I highly recommend Panda Kitchen and Bath. I went into store on Friday, measurements of my kitchen were taken on Saturday morning, my design was ready Saturday evening & I had an appointment to discuss the estimate on Monday. The design (total kitchen remodel) looked awesome and the price and quality of our cabinets were great. The cabinet installation was supposed to take 2 days but only took one day and my countertops were installed a few yes later. I absolutely love my new kitchen! Love our remodeled kitchen cabinets and countertop! Very professional from design to installation! I have to emphasize how great all the staff from Panda Kitchen and Bath have been. They are extremely professional yet efficient and knowledgeable with all they do. I am greatly impressed too at the quality of the work. 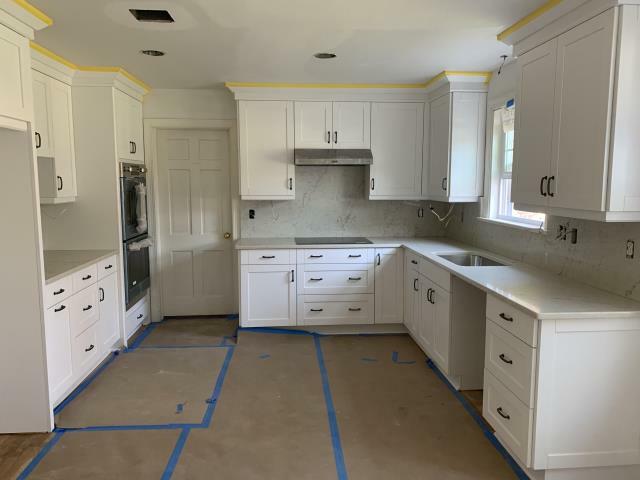 Double Shaker maple kitchen cabinets with the white quartz countertop. This kitchen was completed in 1 1/2 day by our incredible installers. White shaker kitchen cabinets with my favorite quartz in-stock at a very good price with FULL QUARTZ backsplash. Can wait for everything to be completed. This kitchen will definitely be one of the most beautiful kitchens we have completed. 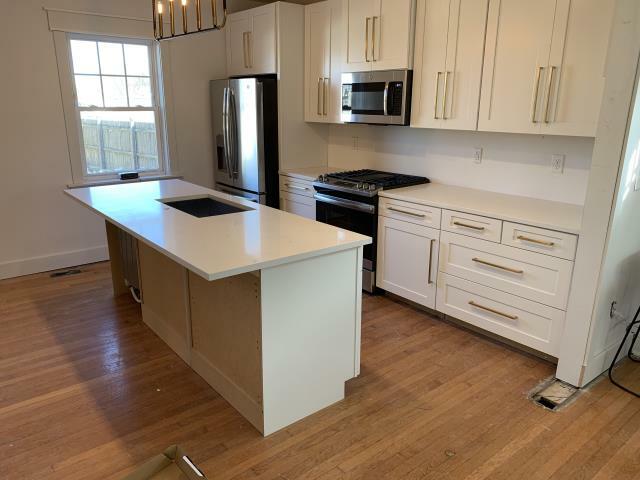 In-stock classical white quartz installed at $55/SF with the white shaker cabinets. 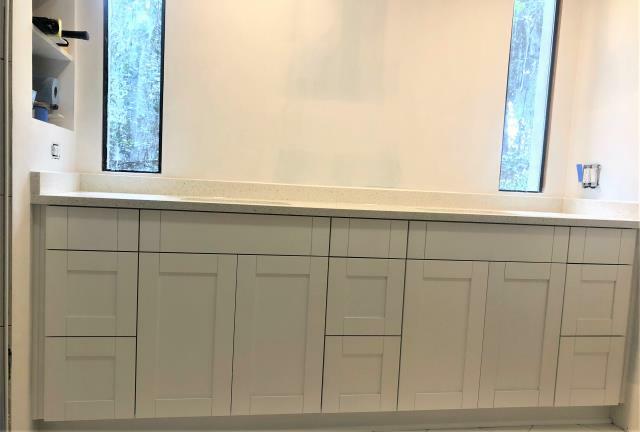 We replaced our clients kitchen with a modern shaker cabinet with glass doors and added a Quartz counter top to complete the look. We also added a custom vanity to the bathroom to finish it all up. in 2014, we installed my client's kitchen and recently she added more cabinets on another kitchen wall. Although it has been 5 years, our vanilla white maple cabinets with the Cambria quartz still look brand new. This is the third bathroom we have completed for this sweet client. 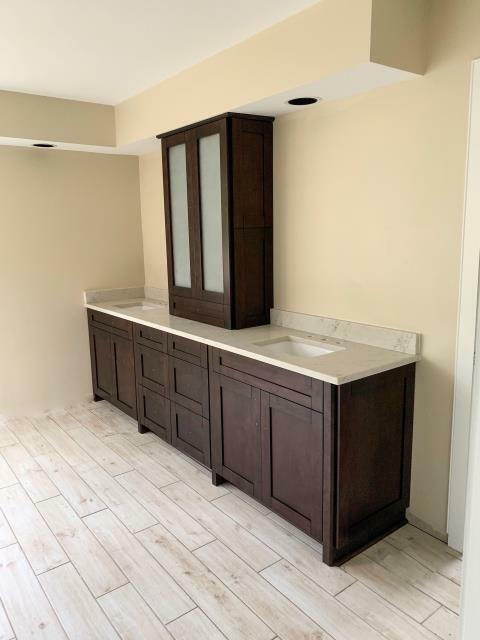 All three bathrooms with the in-stock chocolate shaker maple cabinets. The first two vanity counters were installed with the white ice granite and this one we used the ocean white, my favorite quartz counter. 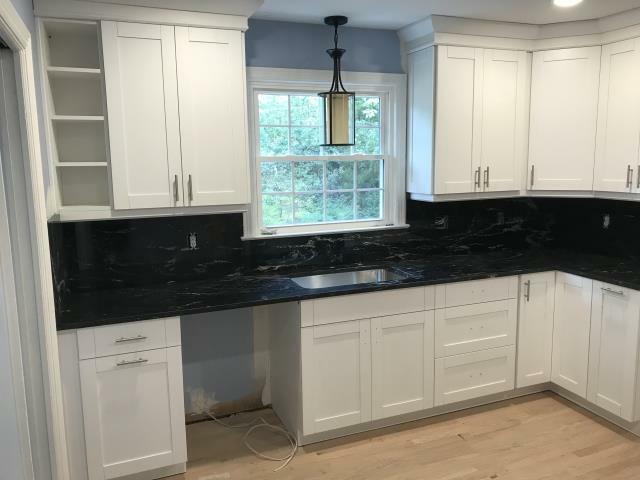 Black Pearl kitchen granite counter with client's existing cabinets. Look at this gorgeous kitchen. 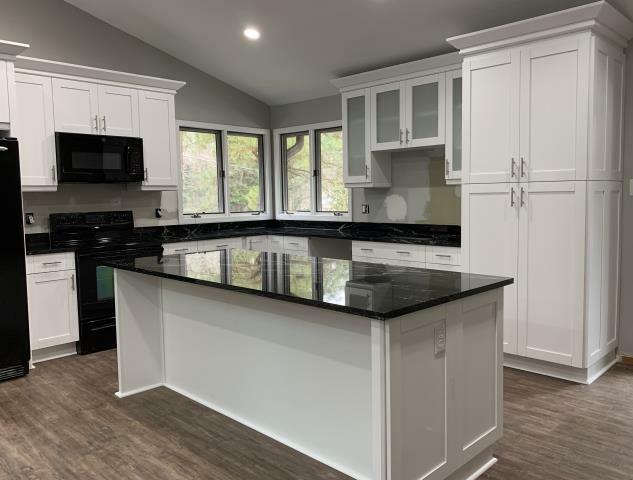 Our in-stock white shaker maple cabinets with the Paradiso Silver granite counters. This classic kitchen is stunning. What a transformation!! Shaker maple cabinets with the Crystal White quartz for the client's master bath. 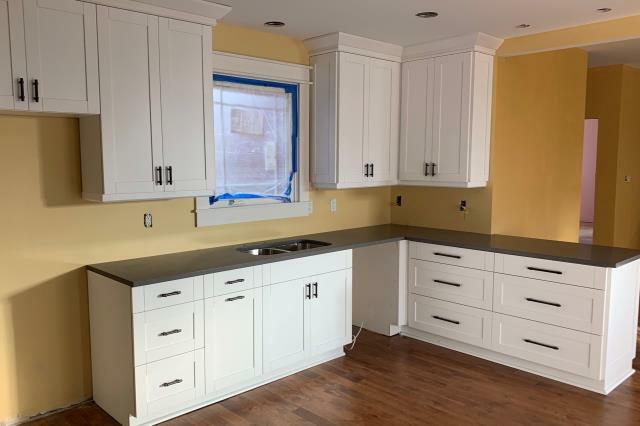 Double Shaker maple cabinets with the Caledonia granite counters all installed in less than 5 hours. We love our white shaker cabinets with dark handles and our in-stock concrete gray quartz counter! Just finished white shaker cabinet installation with our in-stock quartz. 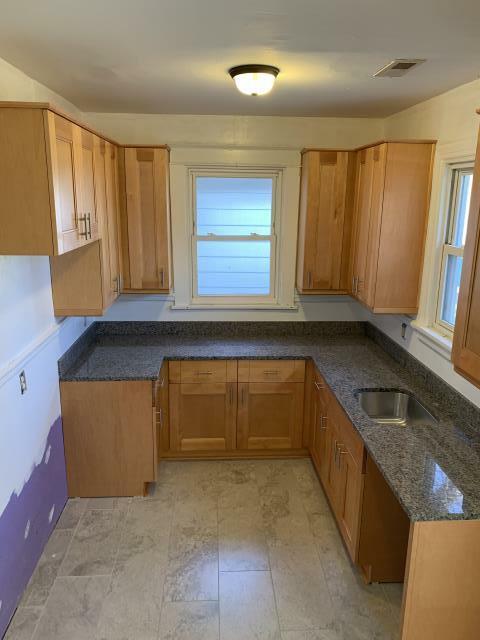 It's going to look great when the appliances, hood and floating shelves are installed! Just installed a beautiful Colonial White granite for a return client. It's the perfect pair for the existing white tile splash and white cabinets. This is definitely one of our all time favorite kitchens we've had the pleasure to design and install! The homeowners selections are absolutely stunning!! Coffee maple island with the gorgeous Carara White Marble is a great addition to my client's kitchen. We hope our client enjoys this beautiful island over the Holidays. 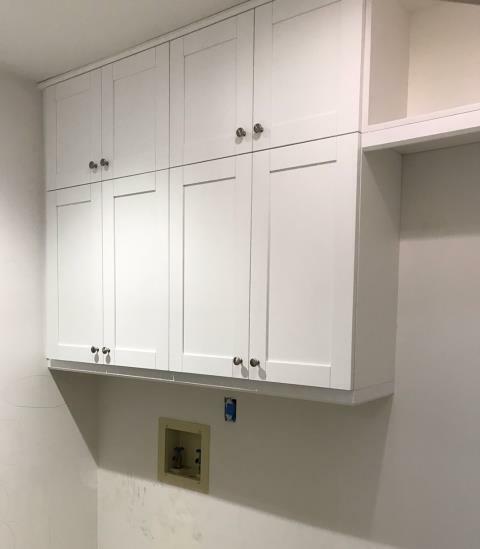 We just finished installing these crisp and clean white shaker cabinets for a laundry room. 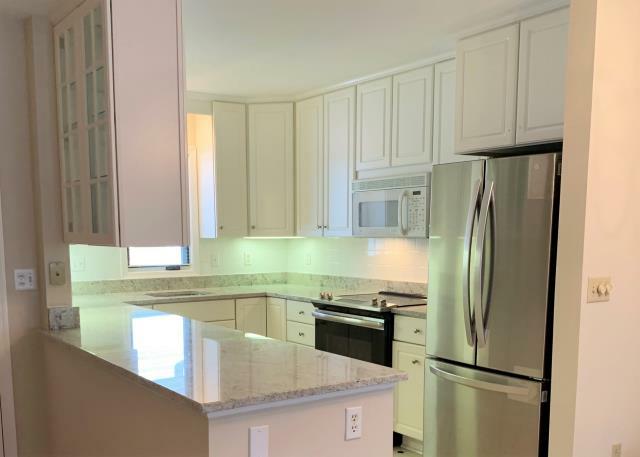 Our in-stock Venetian Ice looks great with our clients warm oak cabinets and stainless steel appliances. White shaker kitchen with our Classical White Quartz. This is the third kitchen we completed for my loyal client. The Paradiso Silver paired with the white shaker is definitely a classic.